- I start off the morning with a face wash using warm water, L'Oreal Paris Fine Flowers Sensitive Gel Wash. I have sensitive skin and I find this has been the best wash for me personally, which hasn't caused me to break out. This wash also doesn't leave my skin feeling very dry and sore which is a bonus, as I find most products feels like it's stripped a layer off my face. - Once my skin has dried I go over with a cotton pad a rose water toner. The one I use I bought in America so I can only find it on an American site, which is Shea Moisture, Rosewater Toner. However my other fave is Pixi Rose Tonic. - I then finish off with a moisturiser. The one I have been loving is very soothing and does't feel too heavy on the skin. A little bit goes a very long way, and with the affordable price it's just an extra bonus so it lasts quite a while. It's called Cosmetic Hydra-sensitive Face Cream. 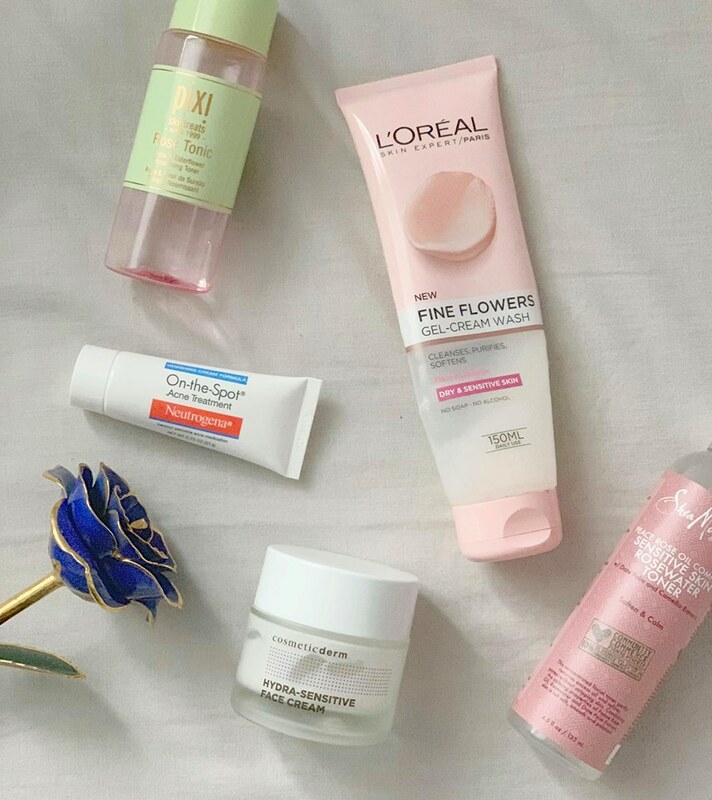 - Using the same L'Oreal face wash, I do this twice if I have a full face of makeup on which is almost everyday for work, focusing more on my eye area as I wear more eye makeup than face makeup. - Using cotton pads, I then go over my face and neck with Garnier Micellar Water for sensitive skin, making sure all of my makeup is completely off. - Going in using cotton pads I then use my rose water toner, as I have recently discovered this has helped massively with any acne scaring, which is now almost invisible. - Once my skin is completely dry, I then go in using the same moisturiser I used in the morning. It's so calming, especially after a face wash as I find my skin goes very red. - Lastly, if I find myself to have the one odd spot, I like to dab a tiny bit of Neutrogena On-The-Spot Cream. Which I wouldn't recommend this product for anyone with ultra sensitive skin, and it's very drying. I find this product helps get rid of my spot within 2-3 days.